(Nanowerk News) By watching how energy moves across a tiny device akin to a springing diving board, Cornell researchers are a step closer to creating extraordinarily tiny sensors that can instantly recognize harmful substances in air or water. The researchers, led by professor of applied and engineering physics Harold Craighead, made a device just 200 nanometers thick and a few microns long with an oscillating cantilever hanging off one end. (A nanometer is one-billionth of a meter; a micron is one-millionth of a meter.) They identified exactly how to tune its sensitivity -- a breakthrough that could lead to advanced sensing technologies. The experiments detailed online Feb. 8 in Journal of Applied Physics show how these oscillators, which are nanoelectromechanical systems (NEMS), could one day be made into everyday devices by lining up millions of them and treating each cantilever with a certain molecule. 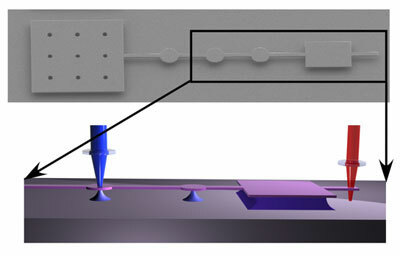 An illustration of the nanoelectromechanical oscillator, with the cantilever on the far right. The inset is a tilted 3-D profile of the structure, which shows the silicon dioxide posts. "The big purpose is to be able to drive arrays of these things all in direct synchrony," said first author Rob Ilic, a research associate at the Cornell NanoScale Science and Technology Facility. "They can be functionalized with different chemistries and biomolecules to detect various pathogens -- not just one thing." The cantilever is like a diving board that resonates at distinct frequencies. In past research, the team has demonstrated that by treating the cantilever with different substances, they can tell what other substances are present. For example, E. coli antibodies attached to the cantilever can detect the presence of E. coli in water. The researchers have perfected the oscillators' design, Ilic said, by laying their device on top of a layer of silicon dioxide, all of which rest on a silicon substrate. A pad with holes connects pegs of silicon dioxide, lined up like telephone poles, which eventually end at the cantilever. The "telephone poles" allow the energy to move efficiently across the device by preventing it from buckling or sagging. The design makes it easy to read the resonant frequency of the cantilever. The research was the result of a collaboration with Slava Krylov of Tel Aviv University. The work was supported by the Defense Advanced Research Projects Agency; the Nanobiotechnology Center, which is funded by the National Science Foundation; and New York state.